I had the privilege of attending morning session at Lehigh on Tuesday. Camp is an enjoyable experience. 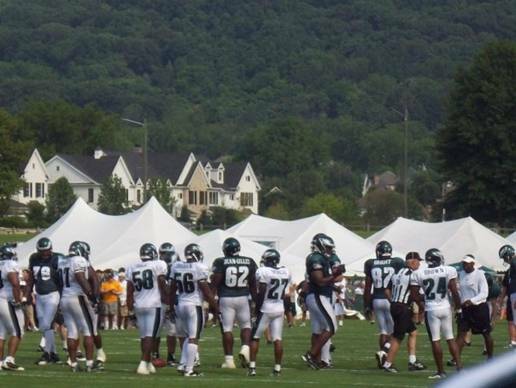 The weather was lovely and all the stars were getting lots of reps with the exception of the still recovering Brian Westbrook. 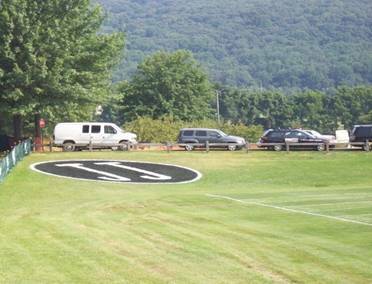 But the mood at camp still had a somber feeling from the passing of the team's legendary coordinator Jim Johnson. Jim Johnson was a perfect fit for this organization. Aggressive, blitzing defenses have always been a staple in Philadelphia and have been a source of excitement for a rabid fan base. Johnson's speed blitz packages, utilizing defensive backs to attack the quarterback, were revolutionary. The game I will remember as Johnson's finest performance was that Sunday night in Foxboro, when he put together a game plan to stall possibly the most potent offense in NFL history. The Patriots were 27 point favorites that night, but Johnson's scheme kept the birds in it to the end. The Pats won the game but the damage was done. Weeks later, Steve Spagnuolo would borrow Johnson's blue print and changed history by ending the Pats perfect season. That script was more suited for Brad Lidge and the Phils anyway. I did my best to bring some pictures back from my trip. Taking these pictures is a tough task, especially when you're all of 5'6� and the fences around the field are lined with centers and power forwards. Enjoy the pictures. Hank Baskett tries to sell teammate Donovan McNabb on his reality show, explaining that it is much better than the �T.O. Show�. 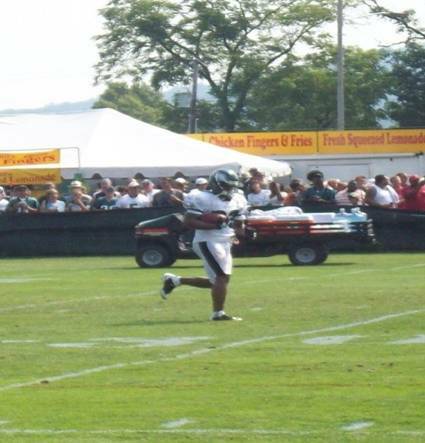 �Shady� McCoy trots back to the line after running down a deep one from Donovan. I got to see him wheel in a few passes. This guy is going to be a player. 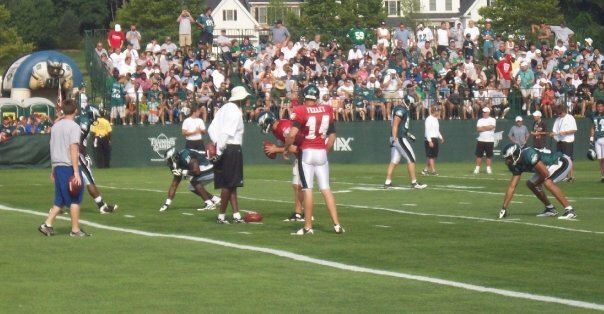 McNabb under center. Donovan looked healthy on this morning. It's comforting that his health is not a big question entering this season like it was in years past. DeSean meets Jason Avant for some Tuesday morning water cooler talk. Probably will be discussing the arrival of Jeremy Maclin for the 2 PM session or the last episode of Jon & Kate Plus 8. 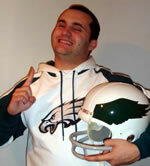 The coaching staff reminds Brent Celek to remove his blue tooth before stepping on the field. QB Kevin Kolb steps in for a few reps.
Hopefully we don't see these two on the field during the regular season. Unless they are taking garbage time snaps when the Birds have a several touchdown lead. Cornelius Ingram reaches for the touchdown. The motion setting on the camera failed to capture this one. This might acutally be Eugene Bright. I took the picture thinking it was Ingram though so I'm sticking with it. Hank's endzone shot comes out much clearer. The camera just seems to love him these days. The question with this picture, where is Michael Gasperson? The guy has been to the past five camps. I figured he was living in Bethlehem by now. The first team defense hits the field. Joe Mays took the reps with the first team at middle linebacker. Looks like he will replace Stewart Bradley for now. CB Sheldon Brown ( # 24 on the far right of the picture ) looked real sharp. He annihilated Kevin Curtis on some one on one coverage drills. Nick Cole defeats Max Jean-Gillies in a �how far does your gut stick out� contest. ( Cole Defeated Andy Reid for this title in 2007). Andy has gotten very hard to spot since he lost so much weight this offseason. He's approximately 15 lbs away from being excused from fat jokes all together. This would be a good brochure picture for those town homes in the background. The people that live there must hate this time of the year. Kolb spikes the ball as the field goal unit gets ready to set up. Check out # 65 King Dunlap. He looks like the second coming of Andre the Giant. Akers nailed every field goal he attempted. The field goal unit sets up for a 35 yarder. 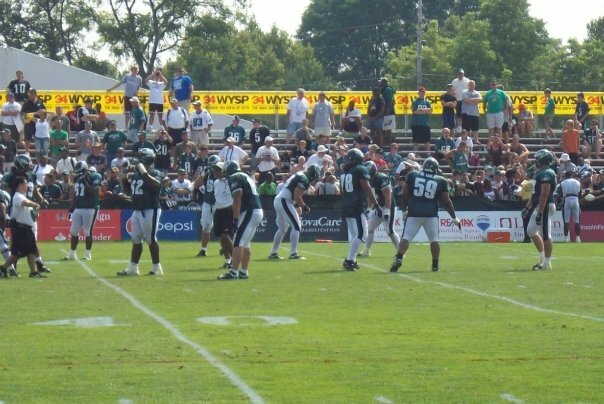 Long snapper Jon Dorenbos practices his new disappearing football trick. The biggest pop from the crowd came a little after 10 AM when this scuffle broke out. I didn't see who started it. The special teamers were spared during the mele. The team huddles up after a long day of practice. The DBs and the linemen had to stay out and do some more drills. Some catching drills for the DBs. New comer Dimitri Patterson makes the catch. After three hrs in the hot sun, the linemen ar starting to get woozy. That's a wrap. 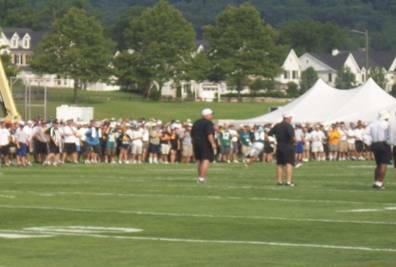 Training camp is an excellent fan experience. I recommend that all Eagles fans make the trip atleast once. You get the chance to get very close to the action and most importantly, its free. You get a lot more for your buck then spending 500 bucks on stub hub to sit in the last row at the Linc. It's a fun road trip to take with friends or family and plenty of great opportunity for free photo opps and autographs. Bring on the season. Go Birds.